As far as I remember, British summertime has been pretty sparse over the last few years and I do so love the sunshine as it’s an excuse to eat lots and lots of ice cream. I remember when I was young (and hot summers were the norm), I used to go to the park with my dad and he’d buy me a 99 flake. I’d always rip off the bottom of the cone, scoop up some ice cream, sprinkle a little flake over the top and present him with a mini ice cream. I used to think that I was presenting him with the biggest treat of his life while I scoffed away at the rest. 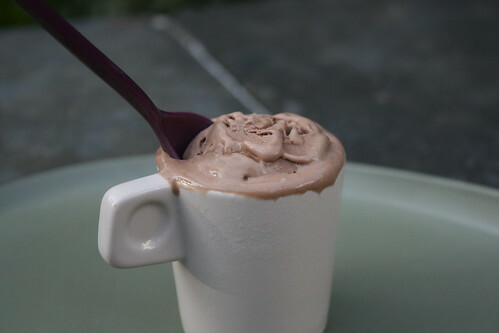 Homemade Chocolate Ice Cream, originally uploaded by Food For Think. I have since moved on from 99 flakes and purchasing ice cream from the back of a van that played the match of the day theme tune over and over again and now my favourite place to buy gelato is Scoop in Covent Garden – worryingly convenient this summer as I work in the vicinity. Also worrying is the fact that not long ago I stumbled upon an ice cream machine that was going spare. Now this is not just some ice cream machine, this is a beast – so last week I thought I would put it to the test. Having a fussy boyfriend, I felt obliged to make one that he would eat as well – after all, I don’t think that even I could get through a whole pot without feeling guilty for not sharing. I turned to my brand spanking new Gizzi Erskine book for the recipe. Hers used chocolate brownies within the mixture but I was baking a couple of other things on the same day so couldn’t be bothered to make the brownie. I watched as the silky smooth chocolate custard churned away to create a melt in mouth sensation – 40 minutes and my ice cream was ready to place in a Tupperware and enter the depths of my freezer but not for long. Oh no, not for long. My friend @foodiestgeorge picked up an identical ice cream machine and we have challenged each other to an ‘ice cream off’ over the summer. She is starting with a Rhubarb Crumble flavour from Food Stories – sounds more fancy but will it stand up to the test. I can’t wait to find out. So jealous! I have neither ice cream machine nor freezer. If I did, I would make pumpkin ice cream. Pumpkin ice cream – wow, that’s a new one. Not sure what to think of that one though!